Ashiatsu Bar Basic Online Course Training with Certification is a 24 CE NCBTMB approved course for massage therapists who want to save their hands from deep tissue massage. Inc: Step-by-step digital color Manual and Video instructions, DYI Portable and Stationary Bar instruction and schematics, multiple choice and True/False Test, Evaluation and downloadable certificate available immediately after completion. We also have other options for the Ashiatsu Online Courses. Buy more, save more. 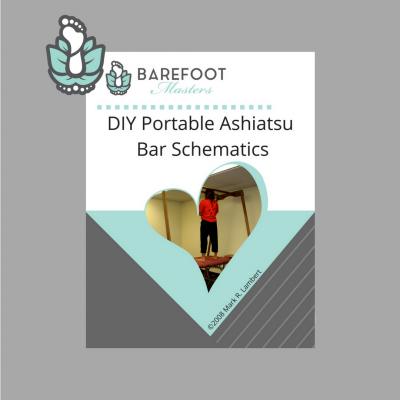 Ashiatsu Bar Barefoot Massage Online courses come with Portable and Stationary bar schematics. This is an instructional barefoot deep tissue massage training for Ashiatsu Bar. NCBTMB approves these 24 CE courses for massage therapists. All the materials are developed for LMT’s who want to save their hands from deep tissue massage. There is no shipping. All digital materials are immediately accessible online 24/7. To note, Barefoot deep tissue massage feels exquisite and yummy. Best of all, clients can’t tell if you are using your hands or your feet. The foot glides over the contours of the client’s body. As a result, compression work is now possible. To balance, we use overhead Ashiatsu bars. Furthermore, instructor Michelle Mace directs you through the entire massage training courses. Due to the elimination of time constraints, this home study is self-paced. Take as long as you like. First, learn all the details by reading the digital manual online. The color manual will take you step-by-step through each move. Then follow along with the instructional Video. You will feel like you are in a live class without the distractions. Hence, students who take the Ashiatsu training this way learn more. This is because they take the time to learn the details. And unlike a live Ashiatsu class, you won’t try to memorize everything the Instructor says. Next, take the multiple choice test online. And last fill out the evaluation to receive certification. The State of New York requires it’s massage therapists to fill out a log sheet as well. Most noteworthy, our Ashiatsu courses underwent vigorous NCBTMB case studies. As a result, it is one of the best Ashiatsu training available. And it also comes with Certification. Course covers: History, Contraindications, Benefits, Care of Feet and Barefoot Technique. Along with Marketing, Bar Schematics, Test, Evaluation and Downloadable Certificate. Access for one year after completion of course training. Also, bar installation supplies are not included. Barefoot Masters® dedicates all its CE’s courses to save the hands and body of the massage therapist. We provide CE’s for the National Certification Board for Massage Therapy and Bodywork. Different states have set rules about CE’s. *Please check your state rules and regulation. *We are not responsible for each state regulation and new rules as they change each month. We try our best to keep up to date. Ashi-Bar Basic $297, Ashi-Bar Basic/Advanced Deluxe $349, Ashi-Bar/Floor Combo $397, Ashi-Bar Basic/Advanced/Floor Premium $447, Barefoot Basics-ashi-Bar/Floor & Fijian $397, Barefoot Deluxe Ashi-Bar, Advanced & Fijian $447, Barefoot Premium Ashi-Bar/Floor, Advanced & Fijian $547, Barefoot Plus Ashi-Bar/Floor, Advanced, Fijian & Barefoot Bar Stretch $597.